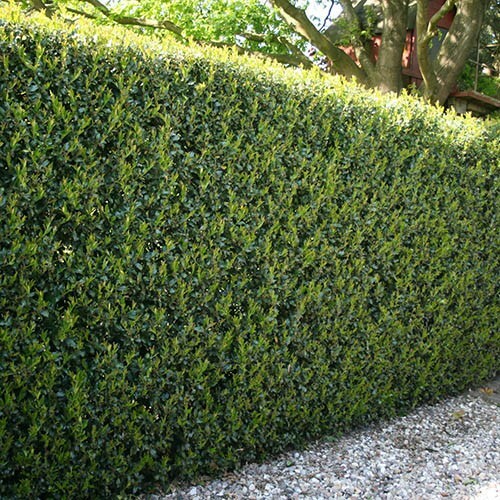 Box hedging has been the staple plant for formal garden hedges across the UK for many hundreds of years. But lately, the emergence of box blight (a disease causing dieback), and box tree caterpillar (Cydalima perspectalis) has led to the search for more robust alternatives for some parts of the UK where these have become a problem. Fortunately, along comes Ilex crenata, and more particularly the selection 'Green Hedge'. Despite its common name of Japanese Holly, the leaves are not prickly, and are small and round, very closely resembling Buxus (Box) - almost identical in fact - although probably a darker green if anything. It is equally easy to trim and thrives on a regular pruning as a hedge, yet is more robust and a little more vigorous in growth. For quickest establishment of dwarf hedges plant this size out all year round at 20cm (8in) spacing. Use in the same situations as you would box - smaller low hedges to separate areas, acts as borders, lining paths etc. However, is also vigorous enough to produce larger topiary too if allowed to grow. Supplied as a trimmed plant in a 9cm pot. Contact us for prices on larger volumes. Plant along flower beds for instant classic style - plants can be trimmed as low as you like. Individual specimen plants require minimal pruning, just removing dead or damaged branches in spring. Topiary needs a minimum once-a-year trim in early summer to keep them neatly shaped, although bushes do much better clipped twice - in May and September. Formal hedges can be trimmed in late summer and a 5-6cm (2-3in) mulch of well-rotted compost or manure added around the base of the plant. Ilex crenata grows well in pots but care must be taken to prevent the roots from freezing. Place them in a sheltered spot during severe weather. Feed with a slow-release plant food to keep the foliage healthy.